If you are over the age of 10, then chances are pretty good that you know how to use a microwave. Microwave ovens are probably one of the greatest assets to the kitchen in the past 30 years. However, microwave cooking can be extremely messy. In order to clean your microwave, you do not need to know what the various microwave oven parts are. You simply need to know what to do. Take a look at our ever expanding library to find out the newest and best ways to clean your microwave quickly. The following articles are available for the 'Microwave' topic. Click the article''s title (shown in bold) to see the associated article. While microwave popcorn can be a wonderful treat, when you forget to stop the microwave at the right time the results are never very pleasant. It can seem like forever until you can finally get rid of that burnt popcorn smell, and sometimes it never really goes away. That is until now! Why do microwave ovens always seem to get so dirty? They are not that difficult to clean, so always keep them as spotless as possible by following these simple steps. It is best to clean the microwave using natural methods instead of cleaners that can leave a smell and taint the taste of your food. Using steam, you can loosen tough spots in your microwave and then wipe the interior clean with a damp cloth. 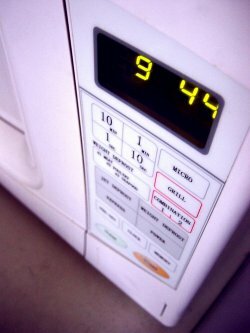 Microwaves absorb the smells of the foods cooked in them. To stop these odors and leave a temporary sweet smell, cook a lemon in water for three minutes in your microwave. This mixture will cleanse your microwave of any offensive odors and leave it with a temporary lemon scent.